We have people like the Ancient Puebloans known as the Anasazi that have lived here since the archaic time 2500-200 BC to Pueblo time 750-1300. When the Anasazi's left the Hopi's came and left after they planted the orchards in the canyon 1300-1600. Around the early 1700's we as the Dine people came into the canyon and utilized the canyon as a shelter, as a place to grow vegetables and hunted. We have all heard about the people of the past and how they utilized the canyon and how they have made their living with the land. They had protection in the cliffs by building their homes in alcoves, made hand and toe holds to climb the walls and most of all planted on the canyon floor. They also did a lot of hunting and did a lot of drawing of what they did now there are only the remains of what is left of them. 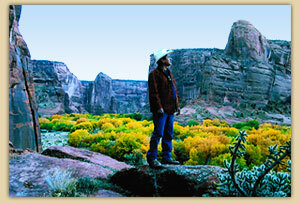 Our guides are very well-educated on the Canyon de Chelly, its culture and the amazing past it has seen. You'll hear stories and tales of the canyon and this rich cultural history through their amazing story telling and guided interaction with this beautiful Canyon. They know stories of the Bering Strait, the land bridge that we as an Athabaskan-speaking tribe migrated on, and also tell the cultural stories of the Creation stories passed down orally through the many generations. Canyon de Chelly, then and now, is the epicenter of Navajo culture. People who live here retain the spirit of their ancestors and traditional beliefs are still reflected in everyday life and how we care for our families, livestock and homes and how plants are collected for ceremonial medicinal and traditional uses and purposes. Because our guides are also residents of the canyon, we can show and explain what we, as Navajos the Dine people, have gone through in the past years and how the canyon is sacred to us all.